KIEV, Ukraine -- It's been a hard year for Antonina Lubyana. First, the pensioner fell from bed, breaking a hip and the bones in her hand. When the fractures failed to heal, doctors discovered she had advanced bone cancer. Lubyana now suffers from debilitating pain and is barely able to sit, even in a wheelchair. Many believe that medical relief from suffering is a basic human right protected by Article 12 of the UN conventions on economic, social, and cultural rights. "It's hard to sit for very long. I have to walk a little every once in awhile, but then I lie down again," she says. "The pain can be very intense, and then you either have to get a shot or take some kind of pills. But the pain never goes away entirely. [The medicine] helps many people, but not me." To fight the aches that shudder through her spine and limbs, Lubyana receives shots of Olfen, a relatively mild painkiller and anti-inflammatory drug. She is one of hundreds of thousands of cancer patients across the former Soviet Union who advocates say are enduring unnecessary suffering due to a shortage of effective, affordable drugs and a legacy of medical ignorance about how to treat severe pain. Still, despite her bad fortune, Lubyana is one of the lucky ones. She receives full-time care in a Kiev hospice, a service that is still a rarity in the former Soviet Union. And her country, Ukraine, this year became the first in the region to legalize better access to strong pain medication for patients dying from cancer, AIDS, and other incurable illnesses. Diederik Lohman, a senior health researcher at Human Rights Watch (HRW), says the measure is a victory for terminally ill patients who previously faced the prospect of enduring a slow, painful death at home. "There was a point where their doctors would say, 'Well, there's nothing we can do for you anymore, because you failed third-line cancer treatment, or the antiretroviral drugs aren't working, or you have incurable [tuberculosis],' and those patients would often just be sent home with [the message], 'There's nothing the medical system can do for you, so go home and die,'" Lohman says. Patients in Ukraine have long had controlled access to certain strong opioids like liquid morphine. But fears about drug abuse meant the process for obtaining the medication was bogged down by bureaucracy and long waits. As many as four doctors were required to approve a single prescription, which could then only be administered at home by a visiting nurse. The World Health Organization recommends that patients in severe pain receive a total of six injections of morphine over a 24-hour period -- a logistical impossibility under Ukraine's current medical system, where most nurses are able to visit patients at home no more than twice a day, if that. The result, especially in rural areas, was patients suffering in agonizing pain for hours or even days at a time as they waited for their next dose of drugs. HRW reported one young cancer patient even attempted to jump from a window as his mother begged doctors to increase his painkillers. The new legislation, passed in May with the approval of the Ukrainian Health Ministry, simplifies prescription procedures and allows patients to keep a 15-day supply of pain medication at home. Most importantly, it has cleared the way for the manufacture of oral morphine tablets, a staple of palliative care in the West since 1977. Supporters in Ukraine say the new drugs will give terminal cancer patients and their families freedom, for the first time, to administer painkillers according to personal need rather than a nurse's availability. In February, Ukraine granted Interkhim, an Odesa-based pharmaceutical company, the right to begin producing morphine tablets. Health advocates, however, say the drug has been slow to enter the market. Lesya Bratsyun, who runs the Ukrainian League of Palliative and Hospice Care, says the shortage underscores the wariness felt by many doctors who have come under strict scrutiny for the kinds of prescriptions they write. "The issue that has come up with regard to prescriptions or patients' access to morphine is that doctors are cautious about prescribing it because they don't know how the prescriptions will be used," Bratsyun says. "So, there is certain caution and unwillingness among doctors to prescribe it because there is that kind of accountability. They are concerned and afraid and they don't know what to do about it." Government zeal to monitor the flow of controlled substances has blocked similar efforts to improve pain treatment in two other post-Soviet countries where HRW has launched health campaigns aimed at liberalizing access to medical opioids. In Armenia, doctors voluntarily inform police each time a prescription for morphine is written for a local patient. Activists say the custom, meant as a means of tracking drug supplies, formally is a blatant violation of patient privacy. In Russia, the distribution of morphine and other strong drugs is so restricted that many patients must receive and fill fresh prescriptions every other day -- a burden that can involve long lines and frequent shortages at the few pharmacies licensed to carry opiates. Cancer patients in the United States, by contrast, are prescribed painkillers in three-month batches and can receive their shipments by express mail. The Russian authorities have also cracked down hard on doctors for writing illegal prescriptions. "Novaya gazeta" reported in May that Aleftina Khorinyak, a 71-year-old doctor in Krasnoyarsk, was fined 15,000 rubles ($450) for prescribing opiates to a family friend with muscular dystrophy and terminal cancer who had spent two weeks in "hellish pain" after local pharmacies ran out of the subsidized supplies he was entitled to. HRW has called for Krasnoyarsk officials to grant an appeal, saying Khorinyak and a co-defendant, who helped obtain the drugs, were acting out of "humanitarian considerations to help a patient with a legitimate medical need, who was deprived access to medications for arbitrary, bureaucratic reasons." HRW has championed palliative care as a human-rights issue since 2001, when researchers grappling with the global AIDS epidemic began to examine deeper questions about the conditions faced by patients dying of incurable illnesses. Since then, numerous global campaigns have been launched to underscore the notion that medical relief from suffering is not only available and affordable but a basic human right protected by Article 12 of the United Nations conventions on economic, social, and cultural rights. Some UN officials have gone so far as to argue that government denial of pain treatment can constitute cruel, inhuman, and degrading treatment -- something that would contravene the UN Convention on Torture. Ukraine, with its proximity to Western Europe and functioning civil-society network, is better placed than most post-Soviet countries to push forward on an issue that may seem a relative luxury in a region that is both riddled with rights violations and accustomed to low-comfort medical care. But Ukrainian advocates say recent gains will be meaningless until doctors learn to prescribe better treatment and patients learn to demand it. "Patients themselves can serve as an important lever," says Viktoriya Tymoshevska, the head of the public health program at the International Renaissance Foundation, a Ukrainian foundation of the Open Society Institute. "Because if they know and understand that the possibility of eradicating pain exists, that the drugs are there, and that all they need to do is go to their doctors and fully demand their right to treatment, that will nudge the system forward. If patients or their relatives don't know about it and don't demand it, then it will remain in a vacuum." As they learn about pain, Ukrainian cancer patients like Lubyana are also learning to come to terms with the question of death and how it will affect their families. Lubyana, who will leave behind a daughter and two toddler-age grandchildren whom she has barely been able to see, melts into tears when asked about the effect her absence will have on her loved ones. "Of course, it's been hugely stressful for everyone. Stress and more stress. It's terrible," she says. "It just works on your nerves, but what can you do?" Hospice Demand High In a country averse to hospital deaths, the hospice at Kiev City Clinical Hospital No. 2, where Lubyana is likely to spend her final days, offers an additional option for families unable to cope with the burden of a home death. 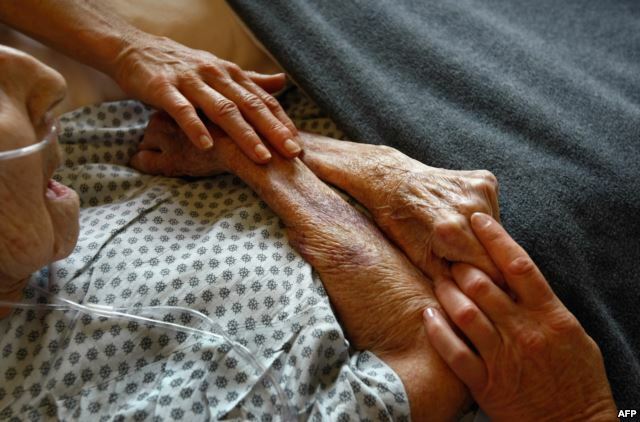 Demand for hospice care is already high. Lubyana's tiny facility, staffed with full-time medical and psychiatric personnel, is built to hold 30 patients but currently cares for 32. Throughout Ukraine there are currently just 600 beds for hospice patients -- a far cry from the more than 4,000 recommended by the World Health Organization. Palliative care itself is only beginning to emerge in Ukraine as an individual field of medicine. There is currently no adequate training for hospice professionals, who in addition to pain management must tackle issues ranging from senility and gastrointestinal ailments to depression and religious beliefs. Lyudmyla Andriyishina, the director of one of the country's best-known hospices in Ivano-Frankivsk, which is in western Ukraine, says there's a pressing need for better medical education in palliative care if Ukraine is to provide complete care for its terminally ill.
"Right now, there are no programs for students on palliative care or approaches to treating chronic pain. To a degree, it exists. Anesthesiologists study chronic pain as it relates to their work; then pharmacists study it as it relates to pharmacology," she says. "But in terms of an overall approach to palliative care and how it should be, so far there's nothing like that for students anywhere in Ukraine."